This year marks the 40th anniversary of the launch of the world’s farthest and longest-lived spacecraft, NASA’s Voyager 1 and 2. Four decades ago, they embarked on an ambitious mission to explore the giant outer planets, the two outermost of which had never been visited. And since completing their flybys of Jupiter, Saturn, Uranus and Neptune in 1989, they have been journeying toward the farthest reaches of our solar system – where no spacecraft has been before. These two intrepid spacecraft continue to return data to NASA daily, offering a window into the mysterious outer realms of our solar system and beyond. 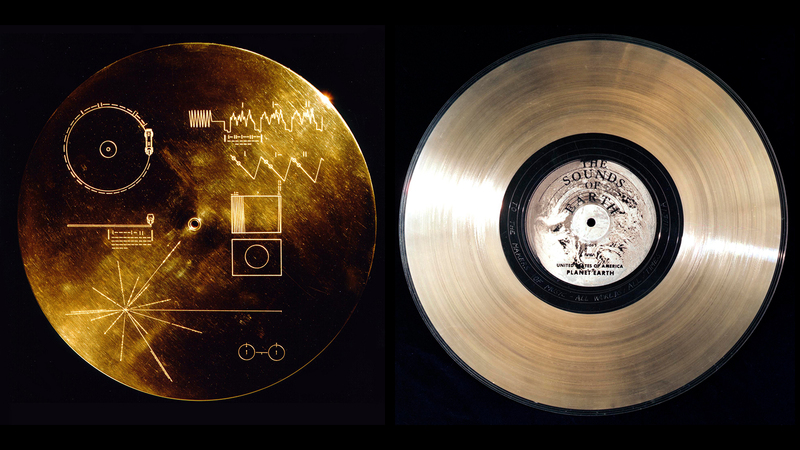 Try these standards-aligned lessons and activities with students to bring the wonder of the Voyager mission to your classroom or education group. The Voyager spacecraft were launched during a very short window that took advantage of a unique alignment of the four giant outer planets – one that would not occur again for another 176 years. (Try this lesson in calculating launch windows to get an idea of how it was done.) Launching at this point in time enabled the spacecraft to fly by all four planets in a single journey, returning never-before-seen, close-up images and scientific data from Jupiter, Saturn, Uranus and Neptune that greatly contributed to our current understanding of these planets and the solar system. In addition to shaping our understanding of the outer planets, the Voyager spacecraft are helping us learn more about the space beyond the planets – the outer region of our solar system. After completing their “grand tour” of the outer planets, the Voyagers continued on an extended mission to the outer solar system. They are now more than 10 billion miles from Earth, exploring the boundary region between our planetary system and what’s called interstellar space. The beginning of interstellar space is where the constant flow of material from the Sun and its magnetic field stop influencing the surroundings. Most of the Sun’s influence is contained within the heliosphere, a bubble created by the Sun and limited by forces in interstellar space. (Note that the heliosphere doesn’t actually look like a sphere when it travels through space; it’s more of a blunt sphere with a tail.) The outer edge of the heliosphere, before interstellar space, is a boundary region called the heliopause. The heliopause is the outermost boundary of the solar wind, a stream of electrically charged atoms, composed primarily of ionized hydrogen, that stream outward from the Sun. Our planetary system lies inside the bubble of the heliosphere, bordered by the heliopause and surrounded by interstellar space. 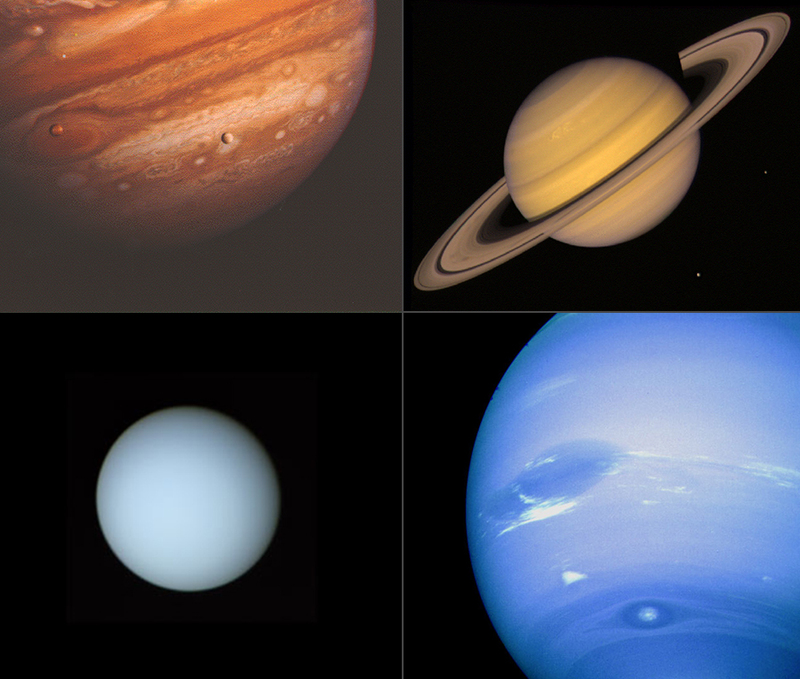 Any flat-bottom sink can provide a visual analogy of these solar system components. In this video, the water traveling radially away from where the faucet stream impacts the sink represents the solar wind. The termination shock is the point at which the speed of the solar wind (water) drops abruptly as it begins to be influenced by interstellar wind. The outer edge of the thick ring of water at the bottom of the sink represents the heliopause. Just like the water in the sink, the solar wind at the heliopause changes direction and flows back into the heliosphere. Credit: NASA/JPL-Caltech. Though we’ve learned a lot about the heliopause thanks to the Voyager spacecraft, its thickness and variation are still key unanswered questions in space physics. As the Voyagers continue their journey, scientists hope to learn more about the location and properties of the heliopause. From their unique vantage points – Voyager 1 in the northern hemisphere and Voyager 2 in the southern hemisphere – the spacecraft have already detected differences and asymmetries in the solar wind termination shock, where the wind abruptly slows as it approaches the heliopause. For example, Voyager 2 crossed the termination shock at a distance of about 83.7 AU in the southern hemisphere. (One AU, or astronomical unit, is equal to 150 kilometers (93 million miles), the distance between Earth and the Sun.) That’s about 10 AU closer to the Sun than where Voyager 1 crossed the shock in the north. As shown in this diagram, Voyager 1 traveled through the compressed “nose” of the termination shock and Voyager 2 is expected to travel through the flank of the termination shock. With four remaining powered instruments on Voyager 1 and five remaining powered instruments on Voyager 2, the two spacecraft continue to collect science data comparing their two distinct locations at the far reaches of the solar system. Since it launched from Earth in 1977, Voyager 1 has been using an instrument to measure high-energy, dangerous particles traveling through space called galactic cosmic rays. 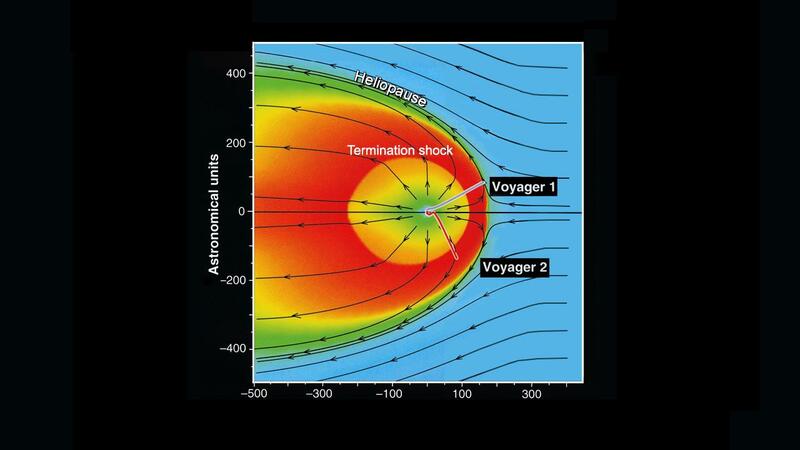 While studying the interaction between the bubble of the heliosphere and interstellar space, Voyager 1 revealed that the heliosphere is functioning as a radiation shield, protecting our planetary system from most of these galactic cosmic rays. So in August 2012, when Voyager 1 detected a dramatic increase in the rays, which has continued to the current peak, it was associated with the spacecraft’s crossing into interstellar space. Meanwhile, Voyager 2 ­­– which is still in the heliosheath, the outermost layer of the heliosphere between the shock and the heliopause ­– is using its solar wind instrument to measure the directional change of solar wind particles there. Within the next few years, Voyager 2 is also expected to cross into interstellar space, providing us with even more detailed data about this mysterious region. 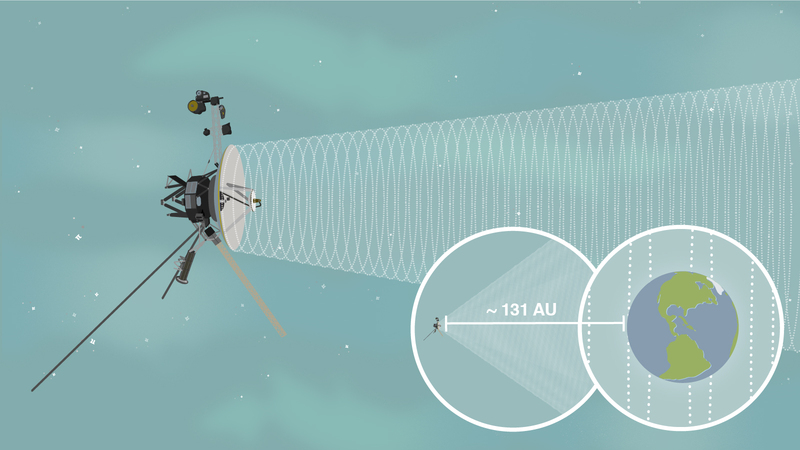 In another 10 years, we expect one or both Voyagers to cruise outward into a more pristine region of interstellar space, returning data to inform our hypotheses about the concentration of galactic particles and the characteristics of interstellar wind. Even with 40 years of space flight behind them, the Voyagers are expected to continue returning valuable data until about 2025. Communications will be maintained until the spacecraft’s nuclear power sources can no longer supply enough electrical energy to power critical functions. Until then, there’s still much to learn about the boundary of our heliosphere and what lies beyond in the space between the stars. Use these standards-aligned lessons and related activities to get students doing math and science with a real-world (and space!) connection. Hear Here - Students use the mathematical constant pi and information about the current location of Voyager 1 to learn about the faint data-filled signal being returned to Earth. Solar System Bead Activity – Students calculate and construct a scale model of solar system distances using beads and string. Catching a Whisper from Space – Students kinesthetically model the mathematics of how NASA communicates with spacecraft.